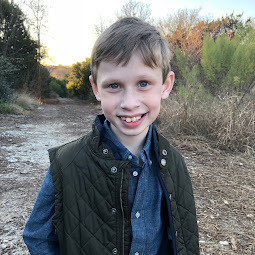 Bennett Brinson Gamel: Fighting Cystic Fibrosis: Update: Where are we?? This adorable paper pumpkin was made by the boys with our very creative and thoughtful babysitter, Margaret, who kept them one evening. Can you see Bennett's scribble on this pumpkin? I'm here! I'm here! I apologize for taking a break from blogging. It is honestly because we have been so busy living life that I haven't had a chance to blog about life! I have lots to share in pictures which I hope to post in the coming days. But I thought I'd share a bit about how Bennett is doing. He is doing really well. His C.Diff symptoms are completely gone (at this point) and he has started eating much better. 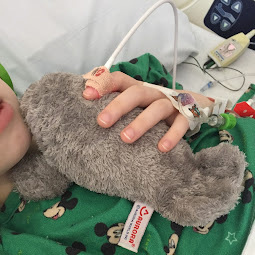 When I complained to Bennett's GI doctor last week that I am concerned about Bennett's lack of appetite, the GI doctor reexamined what we are feeding him. Once he learned we are still feeding him 66% of his calories through the g-tube, he suggested we cut it down by half. We are now feeding him only 16oz of 30 calorie formula for 4 hours per night (and nothing during the day). 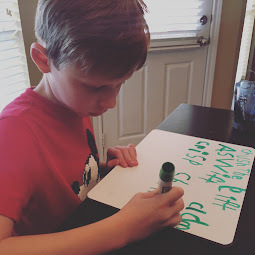 I feel nervous about this decision simply because we have worked so hard to get Bennett up to the 50th percentile with regard to weight (the recommendation for CF children). But, our GI doctor has shown to be wonderfully competent and I believe he understands the risks involved. We are going to try this for about 4 weeks. If we see a dramatic weight loss, we'll have to start g-tubing him again. But we are hoping that cutting down his feeds will make him hungry enough to eat more orally. I've already noticed that he's not as "chunky" as he used to be...but it may be that he's growing taller and getting older. Fortunately, we are seeing him more hungry, which is great. Ultimately, I am having to learn how to be patient and trust God in this. I believe Bennett has some of the best medical professionals caring for him. 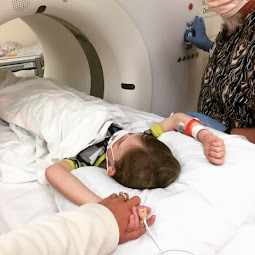 So, I am trying to trust Bennett's pediatrician, his CF doctor, his GI doctor, his dietician and his feeding therapists as they guide us through caring for Bennett's numerous complications due to Cystic Fibrosis (CF, oral aversion, lack of hunger, GI issues, etc.). I trust that nothing we do is irreversible and everything we do is worth trying at some point. I am very concerned that Bennett may never get off his g-tube and may never be able to eat enough to live without it. But I cannot go there. I just have to keep relying on Bennett's doctors to come up with creative suggestions on how we can deal with the delicate balance between keeping Bennett well and getting him hungry enough to eat on his own. For now, I am trusting that this issue is in God's hand and I am trying to focus on other things in life...such as enjoying all of the fun things that the Fall season brings: football games, birthdays, pumpkin patches, crisp weather and Halloween! Pictures to come! !